2019 Comebacks – Can Some Top Prospects Rebound from a Poor 2018? Prospect comebacks are common in minor league baseball. They happen all the time, but not for everyone. Success at one level does not guarantee a prospect’s success at the next. In some cases, injuries can derail a career and sometimes poor performance will do the trick more often than not. In 2018, several prospects at Myrtle Beach and Tennessee struggled mightily. For some of them, this was their first difficulty in pro ball. For others, it was their second year at the level. That can come across as very disconcerting. Scott Kornberg, the Myrtle Beach announcer, and I have discussed several times which level is the hardest test for a prospect. Scott went with high A and I went with AA. For the prospects in this post, Scott and I are both correct. The Carolina League has always been known as a pitcher’s league. The wind tends to blow in from left most days in Myrtle Beach. It’s no wonder that many hitters struggled this year as Pelicans. The Troubled: Aramis Ademan, Wladimir Galindo, Kevonte MItchell, DJ Wilson, and many more. Most of these prospects should repeat Myrtle Beach. Wilson might be the only exception as he is seeing extra time in the Arizona Fall League. His performance in October and November might decide his 2019 fate more than his 2018 season in which he missed almost two months. Ademan, who is 19, should repeat this level, too. While his defense is quite good and getting better, his bat lacks the ability to spray the ball and control the strike zone. The former #1 prospect in the post-Eloy era only hit .209 on the year. His walk rate of 8.4% is very low and his K rate of 21.2% are not balanced enough. No wonder his OBP was only .294 and his wRC+ was a low 66. The one player whose performance surprised me most was Wladimir Galindo’s. In the past, I often referred to Wladimir as “my guy.” He began 2018 in style and was just getting going when the injury bug struck again after missing 2/3 of 2017 with a broken ankle. He did return this year after a month and struggled to get it going. Wladimir struck out an inconceivable 28.3% while only walking 7%. Add in 29 errors on defense and you have a year he’d like to forget. Repeating would not be the worst thing for either prospect. Adjustments have to made, but both players are relatively young (19 and 21) and are still considered valuable prospects within the organization. If both can learn to control the strike zone and layoff some pitches out of the zone, their comeback chances would be greatly improved. Trevor Clifton and Jason Vosler are two prospects who had poor 2017 seasons at Tennessee. Both took the offseason to got their heads right, worked on their craft, and then they earned promotions to AAA by July 1. It can be done. He was the very model of inconsistency. The thing is, that statline is not too far off of 2017, either. I like to watch Charcer play as he has a mixture of power and speed. However, he needs to be a stable hitter rather than a streaky one. 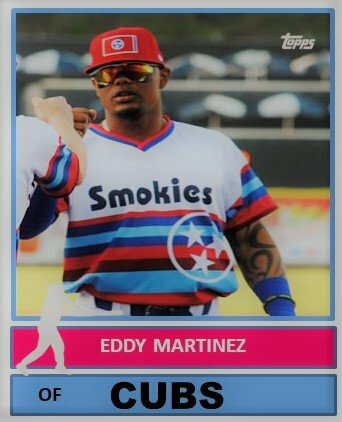 When it comes to Eddy Martinez, now 23, it is hard to know what is going on inside his head. I thought his decent second half in 2017 would bleed over to success in 2018. It just didn’t happen. Eddy just barely scratched a .300+ OBP once and that was in July. For the year, he hit .221 with a .276 OBP, easily underwhelming numbers. Martinez has all the physical tools to be a star but somehow cannot transfer his skill set into the game. Bouncing back from a poor season is easier said than done. If everybody could do it, the majors would have a lot more players knocking on the door. With that in mind, adjustments will have to made and the players will have to buy into changes. The younger the prospect, the better chance those adjustments will stick.